Many people enjoy a snack before bed, and this isn’t necessarily a bad thing. Sure, many people advise not to eat anything after seven p.m. According to many nutritionists and medical professionals, leaving the stomach empty of food means that your body can concentrate on doing necessary maintenance and repairs, instead of digesting a meal. But the truth is, for many of us, having an empty stomach while we sleep, is, well, uncomfortable. It just feels a little more restful to have something in there when we’re sleeping. So if you’re going to eat a bedtime snack, is there one food that’s better than another? You certainly don’t want to chow down on some greasy food or snacks that are high in fat. Fat is complex to digest and the effort your body takes to perform this task could keep you semi-awake, instead of sleeping deeply. The same could be said of proteins. Some proteins are easier to digest than others, of course. Red meat before bed wouldn’t be wise, but a little milk in a bowl of cereal should be fine. Which brings us to a question that many people ask: Is eating cereal before bed a healthy choice? The answer to that is “yes,” with a few caveats. First of all, be wise in your choice of cereal. Many commercial brands are loaded with refined sugar, tons of honey or high fructose corn syrup. Concentrated sugars—especially those highly refined—are going to cause your blood sugar to go rapidly up and then rapidly down. Such abrupt changes will not set the stage well for a restful night of sleep. 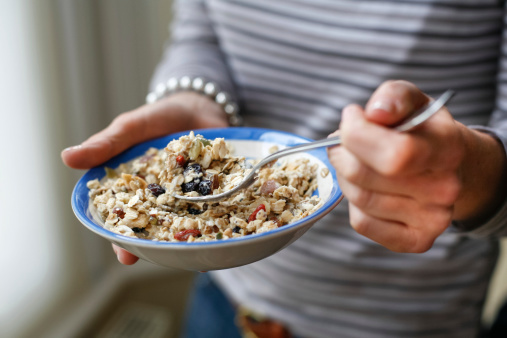 If you think eating cereal before bed is a perfect snack, then you’ll want to avoid highly sweetened cereals and ideally opt for those that are unsweetened. You can always add a teaspoon of honey yourself so that you have control over how much sugar you’re getting with your bowl of cereal. Next, if you’re going to be eating cereal before bed, you want to make sure that your cereal is made from whole grains. It doesn’t really matter what the whole grains are—wheat, kamut, quinoa, buckwheat, oat—just as long as you avoid refined grains and processed flours. Whole grains are high in fiber which has the opposite effect of refined flour. Whole grain fiber will steady your blood sugar levels, slowing down the absorption of sugars so that your body can keep up with processing them. Another consideration before eating cereal before bed is the amount that you eat. Resist the temptation to have a big bowl of cereal. Instead, keep portions small. You want your stomach to have a little food in it, but not be struggling to digest a whole mountain of cereal. A half a bowl of cereal before bed should leave you feeling comfortably “full” but still allow you to fall into a deep sleep. And finally, there’s the matter of what to have with your cereal, when you’re eating cereal before bed. Milk could be a good choice, even though it’s a protein, because milk contains tryptophan. Tryptophan will help to give you that “sleepy” feeling, making it easier for you to drift off to sleep as soon as you lie down. For those who have trouble digesting dairy, obviously you’ll want to stay away from milk. Try some rice milk, almond milk or soy milk instead. Again—keep the portions small. Eating cereal before bed can be a perfect snack to help you feel full before you sleep, without overeating. Would you start eating cereal before bed? Golokhov, D., “10 foods to avoid before bed,” Fox News web site, April 15, 2010; http://www.foxnews.com/health/2012/04/13/10-foods-to-avoid-before-bed/, last accessed Oct. 29, 2013. Sheehan, K., “Can you eat whole grain cereal at night?” Livestrong web site, July 7, 2013; http://www.livestrong.com/article/487344-can-you-eat-whole-grain-cereal-at-night/, last accessed Oct. 29, 2013.